My enthusiasm at this news was quickly met by comments and messages from friends, criticizing the contents of the encyclical and my enthusiasm for this Pope. I have been called misguided and ill informed of the facts. There are few things in life I feel more strongly about than my belief that the Pope, 95% of the scientific community, and the majority of Americans are on the right side of history on this one. The sooner we all get on board, the sooner we can become better stewards of our planet. How taking better care of our collective planet is up for argument is something I will never understand. Some say the Pope has no business getting involved in this issue. I could not disagree more. I don’t see how the Pope’s role is not to look out for God’s creatures and God’s creation. Nothing threatens both more than the environmental degradation we are inflicting on our planet. Even IF you do not agree with the facts about climate change, we are damaging our planet in many ways that go beyond climate change – pollution, pesticides, rainforest destruction, and the incredible damage that we are doing to our oceans has to scare you. These things are all real. This photo right here. 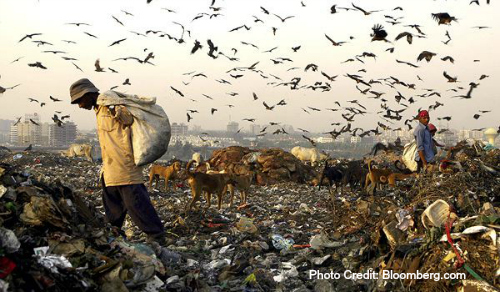 This is a photo of a landfill in India. This is happening. This is happening right now. One last note on climate change. The science is settled on this. It is happening, and the result of human activity. Lots of smart people have spent their entire lives studying this problem, dissecting it from every angle, and offering solutions. The Pope is listening to them. We should too. Science is “bought and paid for” say the conspiracy theorists. Here’s the thing – of course scientific study is funded, but that is not the same as being bought and paid for. There is no “scientific conspiracy” on this issue. There’s a quote by Benjamin Franklin I like that says “Three can keep a secret, if two of them are dead.” The science is settled. There is no “cover up” or “conspiracy”. It’s time to listen to smart people who know much more than we do, as armchair critics and observers. Thank you Pope Francis, for shining a bright light on this issue and bringing it to worldwide attention. Thank you for lighting a fire under me to get back to my blog and my message. You give me hope. Hope for the church, hope for change, hope for the future, and hope for our planet. God bless you on this journey. You have my full support and overwhelming gratitude. 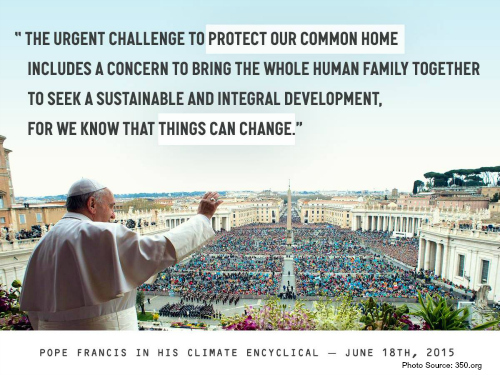 Posted in Environmental Issues and tagged change, climate change, Encyclical, future, hope, message, Pope Francis. Bookmark the permalink. As I dropped my kids off at school today and watched them walk away, I unexpectedly teared up. I have shed many tears over the past few days, but my reaction today took me by surprise. I will not listen to the people who say that I’m not honoring the victims of Friday’s tragedy in Newtown by bringing up the issue of sensible gun control. Because for me, I would not be honoring the victims if I did not fight for this issue. Right now, while everyone is dialed in and listening, is exactly the time. To me, it’s not political. What is political about wanting to protect my own children and, in fact all children, from this happening again? The issue of violence at this level is incomprehensible, and the solutions complicated. It’s no easy fix. But to ignore the possibility of better, to say “now is not the time” or “we don’t need gun control, we need more guns”, well, I just simply don’t understand it. Why can’t we look at solutions? Why can’t we expect better? Why must we wait to do these things? I believe this incident leaves us without a choice. We simply must address these issues and do it now. Nothing is off the table. Let’s look at mental health care. Let’s look at gun control. Let’s look at security in our school systems. Let’s look at educational opportunities. Let’s look at violent videos games. Notice at no time in this post did I mention a BAN on guns. I just said better gun control, so please don’t start with the second amendment stuff. Yes, I know we have the right to bear arms. But, nowhere does our constitution say we have a right to bear semi-automatic assault weapons. I don’t understand the pro-gun hunting crowd’s stance on this either. I mean, the last time I looked, hunters weren’t using 30-round clips to kill a deer. I would think that most true sportsman would agree that these types of weapons are unnecessary. We can also do a much better job in regulating who can purchase guns. It should be at least as hard to get a gun as it is to get a driver’s license. Why is this controversial? Who on earth wants guns in the hands of the mentally unstable or those with criminal records? And stop with the criminals will still get guns thing too. The guns used in most of these recent mass shootings were all purchased legally, not from some underground black market. Oh, and the, they would just use other weapons thing? Last time I looked, you couldn’t kill 26 people in under a minute with a knife. Why can’t we just consider the possibility that it should be easier in this country to get mental health care and harder to purchase assault weapons? Why is that a controversial statement? I want off this spin cycle. The status quo is not working. It’s time for change. Join and support the Brady Campaign to Prevent Gun Violence. Support Senator Feinstein’s efforts to introduce an assault weapons ban, which expired in 2004 and has not been renewed. Sign this White House Petition to immediately address gun violence. Find out which elected officials receive funds from the NRA and write to them. Write to your current state and federal legislators and tell them you support sensible gun control. Be more vocal. Don’t let the NRA voices drown you out. Check out this “Five Lies the Gun Lobby Tells You” for talking points. In addition to better gun control, we also need to look at the inadequate mental health care funding in our country and address the level of security in schools. But for me, school security must stop way short of armed guards in every school, and teachers carrying concealed weapons, and teaching our children to live in fear. If the level of security at our schools needs to be armed guards to take out shooters wielding semi-automatic assault weapons aimed at our children, then I’m out. I will kick and scream and protest outside our schools before I sign up for that gig. Most importantly, as moms we can love. Love our children. Love other people’s children. Love people who agree with you. Love people who disagree with you. Love other parents. Extend a hand to those who need help. Change is in the air, I can feel it. I am hopeful, but beyond just being hopeful, I intend to do something this time. I can no longer stand idly by and let my voice be drowned out. This issue is too important. I choose love. I choose change. Now. Posted in Politics & Other "off limits" topics and tagged activism, change, current-events, gun control, gun deaths, moms, Newtown, NRA. Bookmark the permalink.